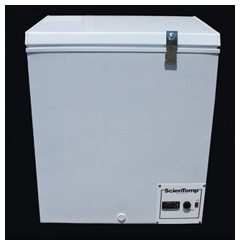 The 34-05 industrial freezer is a ruggedly built, small capacity chest-style freezer which can operate from 0°C to -34°C. It features an all-steel construction, inside and out with key-lockable lid, digital temperature controller, manual defrost and cfc-free refrigerants. For use in laboratory or industrial applications where performance and quality count. Scroll down to the bottom of the page to e-mail us for pricing and more info.